The streets have spoken, fall's hottest jacket isn't the blazer, combo jacket or leather bomber: it's the varsity. Channeling the fashion editor's and street style trendsetters take on the varsity jacket, we've looked to the sleek mixed media pencil skirt to give the throwback piece a modern counter. Playing off the varsity jacket's old-school vibe we added a vintage like printed sheer button-down to match the jackets retro feel. 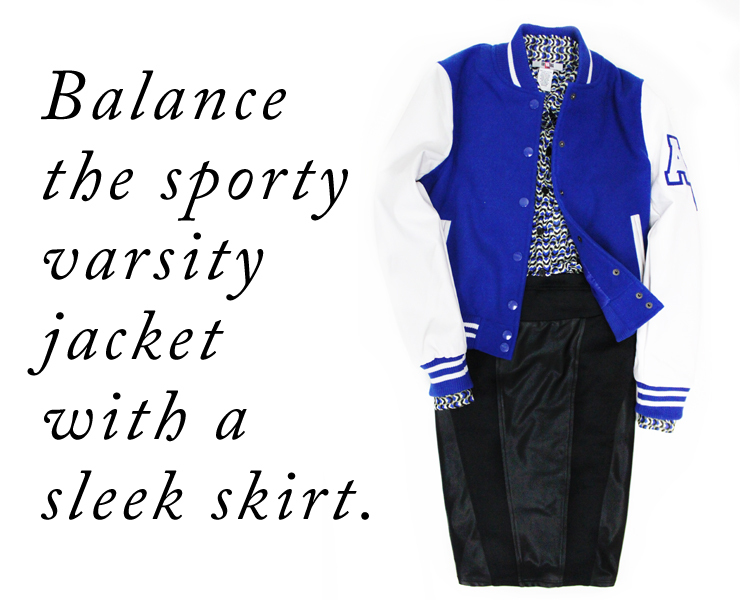 Featured Items : Varsity Jacket, $24.99 ; Printed Button-Down Blouse, $16.97; Mixed Media Skirt, Coming Soon.